College football is burdened by the longest offseason of any major sport, but it doesn’t waste any time in the transition: The first projections for the 2015 season began arriving, piping hot, in the wee hours of Tuesday morning, even before the crews at AT&T Stadium had managed to sweep up the confetti commemorating Ohio State’s championship win over Oregon. If you already feel behind, here’s what you need to know to keep up with the debate until actual football returns. College football is burdened by the longest offseason of any major sport: eight solid months from final gun to opening kick, with each one certain to drag on a little longer than the last. But it doesn’t waste any time in the transition: The first projections for the 2015 season began arriving, piping hot, in the wee hours of Tuesday morning, even before the crews at AT&T Stadium had managed to sweep up the confetti commemorating Ohio State’s championship win over Oregon, and well before next season’s rosters began to clarify following yesterday’s NFL draft declaration deadline. If you already feel behind, here’s what you need to know to keep up with the debate until actual football returns. In the end, the Buckeyes’ postseason run was so decisive that it felt inevitable, as though they’d emerged last August as a fully formed juggernaut and were merely waiting for the rest of us to get up to speed. In reality, the most eye-opening aspect of their ascendance was that it so clearly arrived ahead of schedule: After incumbent quarterback Braxton Miller was bounced from the lineup by a preseason shoulder injury, Ohio State was resigned to suffering through growing pains for eight new offensive starters, including Miller’s successor, redshirt freshman J.T. Barrett. 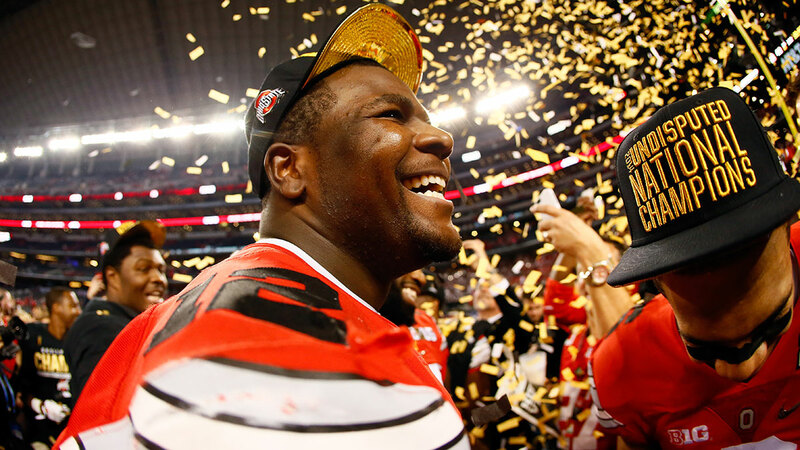 Even Urban Meyer conceded after the championship game that he never thought of the 2014 team as a serious national contender, but rather as an outfit that would have to “battle and battle and find a way.” That the coronation came when it did and how it did, with underclassmen in all of the most prominent roles, provided a frightening premonition of what this squad will be able to do when its long-assumed appointed hour arrives. Obviously, an abundance of riches at the sport’s most important position is one of those good problems. But it’s also just the tip of the iceberg: In addition to multiple championship-caliber quarterbacks, the 2015 depth chart will feature the MVP of the playoff run, tailback Ezekiel Elliott; five of last year’s top six pass-catchers; four returning starters on the offensive line; and eight of the top 10 tacklers, including Joey Bosa, a unanimous All-American on the defensive line. Incredibly, for an elite team driven by youth, not a single underclassman declared early for the draft. And so, for the next six months at least, Ohio State is no. 1 in every conceivable sense: past champ, present favorite, and dynasty-in-waiting. This is usually where I’d drop in a caveat acknowledging that all assumptions are dependent on health, but in 2014 even key injuries were no match for this team’s depth. Technically, the Buckeyes were underdogs in each of their last three games en route to the title, but from here on, the next game they lose under Meyer will be a stunner. But … TCU Is Maybe Also No. 1? 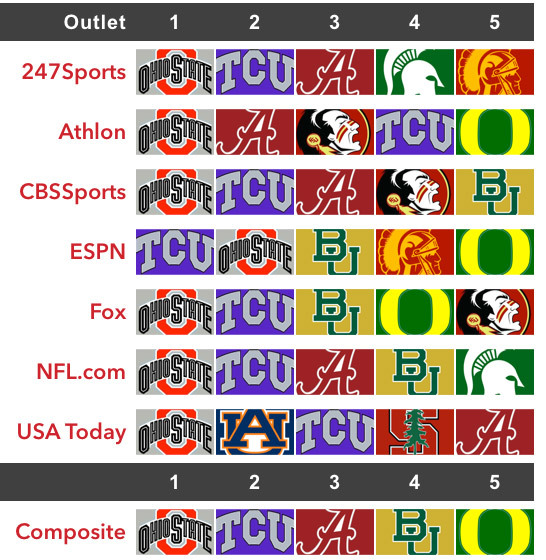 No fewer than seven mainstream outlets used the championship game as a springboard for their “Way Too Early” power rankings for 2015,1 and surprise, surprise: Nearly all of them stuck with Ohio State as the preliminary favorite to repeat. But the most popular challenger to the Buckeyes’ throne is an unfamiliar one: TCU. 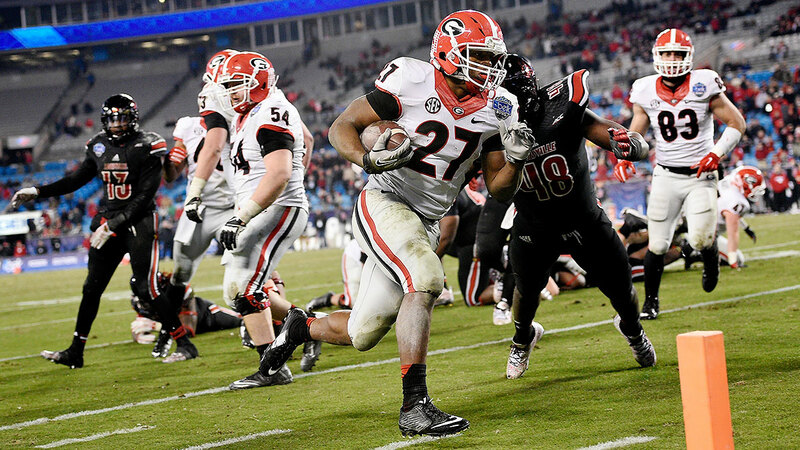 Athlon’s entry arrived on December 29, before any of its top five teams had played their respective bowl games; the rest were all posted in the immediate aftermath of the title game. In 109 years of football, TCU has never kicked off a season ranked in the top five in the AP poll and hasn’t reached no. 1 at all since finishing there in 1938 after capping its lone national championship campaign with a Sugar Bowl win over Carnegie Mellon. Rarely, though, has TCU made a statement on a national stage as emphatic as the one it made in its last game, a 42-3 incineration of then–no. 9 Ole Miss in the Peach Bowl, which served as the exclamation point on the most dramatic single-season turnaround in the nation. The rampage against the Rebels was also a kind of rebuttal: In another timeline, the Frogs might have been the team receiving the final playoff berth — TCU ranked ahead of Ohio State in every edition of the playoff committee’s weekly rankings until the decisive poll on December 7 — and capitalizing with a program-defining run to the title. Instead, they were left to contemplate what might have been if not for their only loss, a wild, 61-58 decision against Baylor that saw TCU blow a 21-point lead in the final 11 minutes, and then left to vent by reducing the no. 1 scoring defense in the nation to a few barely discernible wisps of ash. Major contributors who touched the ball for TCU in the bowl game will be back next year, including above-the-fold quarterback Trevone Boykin; so will four-fifths of the starting offensive line, the heart of the unit that ranked second nationally in scoring offense. This time, Baylor — coming off the best AP finish in school history, at no. 7 — won’t appear on the schedule until the very end, by which time the Bears’ quarterback vacancy should be resolved and the stakes could be even higher than they were last October. Last year, Florida State struck the first blow against the SEC’s reign by rallying to beat Auburn in the final iteration of the BCS National Championship, the first time a non-SEC team had claimed the title since 2005. This year, the facade crumbled in much more dramatic fashion: After crowding the polls throughout the regular season,2 the top five teams in the vaunted SEC West (Alabama, Mississippi State, Ole Miss, Auburn, and LSU) all lost their bowl games, and for the first time everyone seemed willing to concede that perhaps the emperor had no clothes. Of course, under the old system, this season’s championship game would have pitted no. 1 Alabama against no. 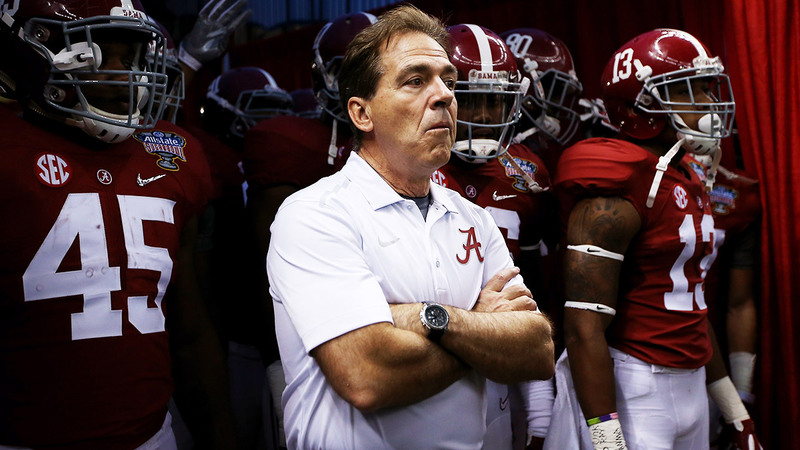 2 Florida State — a game Alabama almost certainly would have won, thereby reinforcing the status quo. Had the playoff existed six years ago, the sport might have been spared the SEC’s superiority complex altogether. The first playoff committee rankings in late October featured four SEC West teams in the top six. Admittedly, the tendency to overreact to bowl games is the exact fallacy that birthed the Ess-Eee-See meme in the first place. (Note that teams from the SEC’s East division, which combined to go 2-12 against the West in the regular season, went 5-0 in bowls against the West’s 2-5, signifying nothing.) Still, the notion of Southern superiority was always a case of perception with occasional corroboration from reality, and the idea has lost its grip. The final AP poll reflected a remarkably egalitarian landscape, with a Top 10 made up of two teams from each of the five major conferences. The projections for next year don’t universally assume that the SEC champ will have a standing reservation for the final four. SEC fans still care more, of course, but if they expect the benefit of the doubt in polls, their teams will have to earn it, just like everyone else. As late as November, I was still writing about the Big Ten’s toxic reputation in the conference wars, a milieu defined largely by Michigan’s ongoing irrelevance under coach Brady Hoke in addition to the stagnation at Nebraska and Penn State. Wolverines fans know the streaks like the back of their mittens: Since 2008, Michigan is 3-16 against its chief division rivals, Michigan State, Penn State, and Ohio State, with the struggles against the Buckeyes extending back a full decade; the Wolverines haven’t sniffed a Big Ten championship since sharing it with Iowa in 2004. At some point in Hoke’s administration the offense limped into the woods to die and was never seen again. The day Hoke was finally fired was the same day his equally beleaguered predecessor, Rich Rodriguez, was named the Pac-12’s coach of the year for his work at Arizona, a fitting reflection of the sense that Michigan’s problems begin with Michigan. Simply by saying yes to his alma mater, Jim Harbaugh cleared all of the detritus of the past decade and made Michigan fans feel the way they think they’re entitled to feel as patrons of the sport’s all-time winningest program. The comparisons to Meyer at Ohio State and Nick Saban at Alabama are apt: Coaches with Harbaugh’s track record, at Harbaugh’s age, only come along once in a blue moon, and with maximum resources at their disposal the momentum they’re able to generate just by showing up and being competent is enough to create a monster. 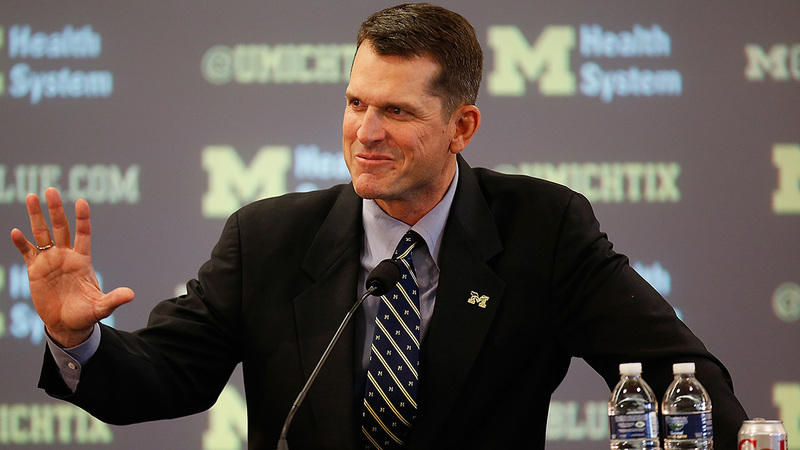 Factor in Harbaugh’s single-minded, lunatic intensity, and Michigan’s cup suddenly runneth over with optimism. Whatever happens in the long term, 2015 will feel like the year the Wolverines are back. … and is still only scratching the surface of his potential? Fournette is like some kind of military experiment on the limits of human physicality that’s still working out the kinks. I wouldn’t be surprised to learn this year that he doesn’t need to sleep. By comparison, juniors-to-be Elliott, James Conner (Pittsburgh), Alex Collins (Arkansas), and Derrick Henry (Alabama) — all of whom other than Collins, like most of their freshman counterparts above, check in north of 225 pounds — seem like grizzled vets on their farewell tours. Considering that Melvin Gordon just came in second in the Heisman chase after arguably the best season by a college running back since Barry Freaking Sanders, it’s debatable whether the award is still open to running backs at all. If it is, though, there will be no shortage of contenders in 2015. In the meantime, if you’re looking to invest in a promising young quarterback before the rest of the Heisman market catches up, look no further than Clemson rising sophomore Deshaun Watson, who was off to a brilliant start last year before his debut was derailed by injuries; in the end, he finished just ahead of Mariota as the most efficient passer in the nation with at least 100 attempts. An older, presumably healthier Watson will be as close as any quarterback this side of Boykin and the eventual starter at Ohio State to a blue-chip stock. Oregon has won more games over the past six years than any other FBS program except Alabama, a span that includes four conference titles and two cracks at a national crown. As Michael Weinreb articulated earlier this week, though, the Ducks’ championship flop against Ohio State has brought them to a rarely traveled crossroads. Unlike fans at most powerhouse programs, where resources are taken for granted and the next title run is never considered more than a new coach and a solid recruiting class or two away — see: Michigan — most Oregon fans still remember when their team was anything but a perennial contender that racked up 10-win seasons as a matter of course, and on some level they must be wondering when their stay among the elite is going to conclude. In that context, 2015 may be as important a year for the direction of the program as the one just concluded. Mariota is on his way out, effectively taking with him the last vestiges of momentum bequeathed to coach Mark Helfrich by Chip Kelly two years ago. Everything had been building toward a run behind the Ducks’ remarkable, once-in-a-generation quarterback, an ascension that was supposed to culminate on Monday night. 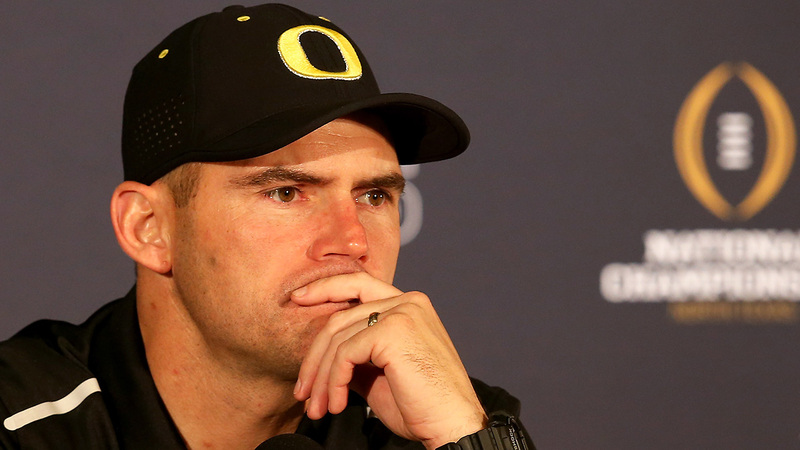 With the summit remaining out of reach, Helfrich is left to regroup with a lineup that figures to generate very little buzz nationally and may not even be the obvious favorite in the Pac-12. Oregon is entering an entirely new phase in the project: How will the program that’s committed the past two decades to crafting an elite foundation handle its first encounter with rebuilding?